Don’t call it a come back, my rappers retirement was merely a breif respite from beef eating. Now, my return to the ring has been one of controversy, bad beef, and silicon implants. Spurred frightfully on by a man named Bob, a force so outrageous and discomforting, something had to be done. I just had to come back. Bob’s Burgers and Brew in Everett was the stop. One of 10 or so locations found in northwest Washington. A decent little shop from what I recall back in the days of Bellingham eating. Clearly, things are different now. As champions around here it’s fitting we chose to review the self-proclaimed “true meal fit for a champion”, the Ranch Burger. A six ounce charbroiled patty with american cheese, lean meaty bacon (whatever that may be) and a large farm fresh egg. As my penchant for chesse does not extend to it’s evil step sister, american cheese, I became a sauce-on-sider for the moment and upgraded to swiss cheese. Upon arrival, to the side resided a stack of garden; tomatoes, pickles, lettuce, and savory sauce. Let’s begin this tale with what went right. The bun was toasted. And toasted well. Thank god for that. The vegetables were serviceable. Mostly fresh, mostly crisp, and mostly appealing. And the biggest plus of all, the savory sauce was on the side. Plus three trillion points for that. Goopy, separated, lardtastic and freakish in color. Like the color of a cheap bandaid, only less appetizing. And then there was the rest of the plate. Ok. Hold on here. I’m sorry. But no self respecting ranch would ever murder an egg like that. Overcooked, rubbery, and sad. The yolk chalky like powdered sulfur. It could have been used to make fireworks. The cheese was unusually sweaty and wet. That midpoint fail area when the cheese is between chilled and melted but distinctly neither. That or it had been crying. Given it’s treatment, entirely possible. The bacon was low end stock grocery store and about as memorable as Phyllis Diller in Scooby Doo. Sorry Phyllis. So what about the beef you say, that grey disc of mystery hidden underneath the silicon egg implant? Yeah. That wasn’t good either. Previously frozen. Bland. Insipid. Hurtful. And very likely the reason I spent the rest of my evening streaming hilarious content to my ipad while sitting on the toilet. Bob’s joke extends from the burger to the “brews”. Nine or so selections of beer, none made in house, most of which were domestic beers for the masses. Coors, Bud light, and the rest of the liquid criminals. Among beer drinking brethren, “brew” on your sign out front has meaning – A decent selection of real beer. Hell, there were more umbrella drinks on the menu then brews. Not the end of the world, but stop lying to me Bob. 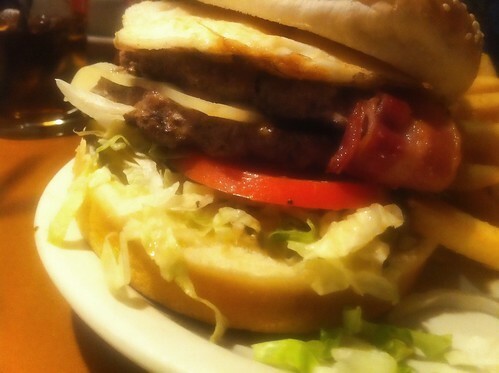 + I give hooves up for a nice bun, nicely toasted, and to whomever made the call to serve the savory sauce on the side. – I give hooves down for just about everything else. And waiter dude. Dear god. Self-medicate much? Man, you must have REALLY pissed someone off to get served like that at Bob’s. I spent 26 days in Yakima in September with a Bob’s right in front of my hotel on Fairview Ave. I ate nearly everything on the menu and never had a single complaint. Bob’s Bonanza is almost too big. The Hawaiian burger was probably my favorite. I have a friend who’s bar was on ESPN’s Top Ten Best Sports Bars list. I told the crew at Bob’s they could easily stand up to them ANY TIME. They also had 9 different craft beers on tap, all from Washington State. Iron Horse Irish Death is probably the best I have ever had. Having grown up in dear old Everett, I would expect no less. Love the part about the ipad and sitting on the toilet. Funny comment, not funny situation. Funny thing about Bob’s is that you’ll find them in Washington State on just about every Native American reservation land next to a freeway (preferably around other tourist attractions like outlet stores). This used to be the go-to weekend late lunch spot for me and my friend who lives around the corner from here. She still goes, but i can’t bring myself to. The thing is, i’m giving the place 4 stars because the food is delicious. I have loved everything i ever tried and i really like the different sauces you get with your chips when you eat in. If you have a favorite, they will bring some out to you if they have it in the back. The service is fine. But, like someone else pointed out, for some reason it takes forever to get your water refilled. Dont know what thats all about.Now, the reason i dont go to El Jarocho anymore is this: After sampling a good swath of the menu, i tried the El Jarocho sandwich (torta) and immediately fell in love. This sandwich had everything: ham, a fried piece of fish, avocado, tomato, cheese, some sort of spread. I dont even know the rest but there were several more ingredients involved and it was HEAVENLY.The something tragic happened. They CHANGED THE BREAD! The bread used to be crusty and chewy, kind of like untoasted panini bread or something. The new rolls were fluffy, cakey, and completely overwhelmed the ingredients in the sandwich. After the bread changed, i still got the sandwich three more times. Three times i choked down the dry, sad version of a sandwich that used to be sheer perfection before i gave up entirely. After being separated from my favorite torta i couldnt go back to the other menu items, so i have opted not to return.So go go go! Try El Jarocho. Just stay away from the sandwiches unless spongy, dry, tasteless bread is your thing.